Fansite Supporting Derek & Julianne Hough on their 'Move Live On Tour'! ← ‘Move Live on Tour’: FINAL SHOW in Los Angeles, CA (07/26/2014) – Miscellaneous Photos, Fan Tweets, Photos, Videos & More! 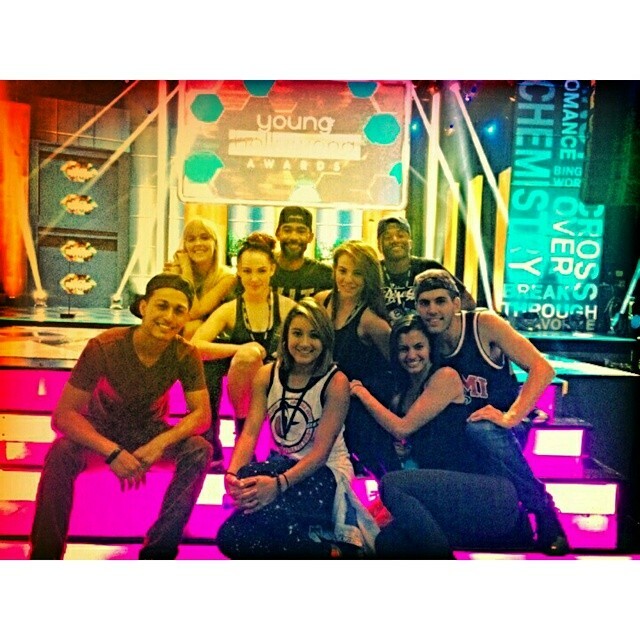 The day after “Move Live on Tour’s” last show in Los Angeles, Derek and the MOVE dancers had the privilege of performing one of their energetic numbers at the Young Hollywood Awards on July 27! Derek was nominated for “Hottest Body of Work” and “Best Bromance” with Mark Ballas. They performed their fast-paced opening number with Nika and Brittany replacing Julianne for her parts with Derek. It was AMAZING to see them perform on television! I wish the entire “Move Live on Tour” show could be aired on television for all the fans to see…. 😉 Derek won the award for “Hottest Body of Work” (of course! ), but lost out to Channing Tatum and Jonah Hill for “Best Bromance”. Check out VIDEO of their performance on PureDerekHough! Here are also some great screencaps from PureDerekHough! Amy Purdy was also there to introduce Derek and the MOVE dancers and afterwards partied with them in celebration of the conclusion of their successful tour! Check out all the great pictures below! Incredible HQ Photos from Zimbio pictures. Derek and the MOVE dancers pictured with host Kelly Osbourne and Louie Vito. My ‘Move Live on Tour’ Videos! ‘Move Live on Tour’ – An experience that will never be forgotten! ‘Move Live on Tour’: FINAL SHOW in Los Angeles, CA (07/26/2014) – Miscellaneous Photos, Fan Tweets, Photos, Videos & More! ‘Move Live on Tour’: San Francisco, CA (07/25/2014) – Miscellaneous Photos, Fan Tweets, Photos, & Videos!